Born from the experience gained over more than 50 years of production of the King Air line, this aircraft combines the main qualities of Beechcraft in a single model. For this reason, it is one of the most reliable turboprops in the world. Among the many attributes of the King Air 250, of note are the incredible combination of winglets, composite propellers, and two powerful PT6A-52 engines, which bring unparalleled performance and reliability in the category. 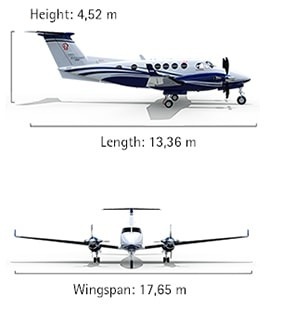 The King Air 250 is indeed an amazing aircraft, including the price. For everything it represents, encompasses, and offers, when you choose the aircraft you can be sure you are getting the best value. When you enter the King Air 250, you will be aboard an aircraft that is the result of more than 50 years of line production, continuously perfected by Beechcraft. Traditionally, an excellent airplane. The 250 model maintains the classic design of the King Air line, including the oval cabin, which brings even more comfort and convenience. The model features a sophisticated interior, including finely crafted seats that slide and recline sideways, offering even more comfort to passengers. 5 Sea Level, ISA, No Obstacles.